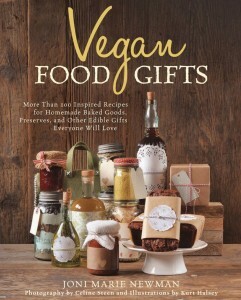 Vegan Food Gifts review - best vegan cooksbooks Vegans Eat What? Help support us by ordering this book on Amazon.com! What is universally loved as a present? Homemade and specialty foods! This book is full of food gift ideas and recipes, including creative ways of wrapping and packaging those gifts! It includes baked goods, preserves, vinegars, dry mixes, infusions, drink mixes, liquors, sauces from sweet to savory, doggie biscuits, truffles and more! One of the things that I really appreciate about this book is that there are recipes for items that are easy to mail – not impacted by extreme cold or heat, lightweight, and that store on a shelf for a long time. This book features codes that designate the difficulty level of each gift recipe or project as well as the cost range and time to make. We tried Cowgirl Blackening Rub, Hearty Pasta Soup with Chik’n Mix, Cheesy Potato Soup Mix, and Roasted Garlic. And we made a dozen gifts of each, mailing most of them to other states and asking recipients to give us feedback. As one would expect, different households had preferences for different combinations. Most said to cut the salt in half in the Cowgirl Blackening Rub. The most universally loved gift was the Cheesy Potato Soup Mix that we feature below. In addition to its subtle flavors, people loved that you could mix 1 serving at a time if one person wanted a warm lunch quickly. Mix all ingredients together in a mixing bowl until well combined. Add water and butter to a large soup pot and bring to a boil over medium-high heat. When butter has melted, stir in milk and then the soup mix. Stir until smooth. Remove from heat. For thicker soup, add less milk, and for thinner, add more milk.